Pick up the Outdoor Edge Wood Devil for all of your outdoor chopping needs. This model is outfitted with a black finished blade and a grippy black and red handle. Stainless steel axe head with a 4" cutting edge and a hammer back for versatile use. 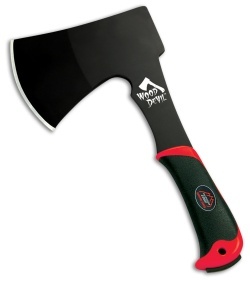 Rubberized handle with an ABS core provides a durable, high performance grip. Item includes a nylon belt sheath for secure carry.